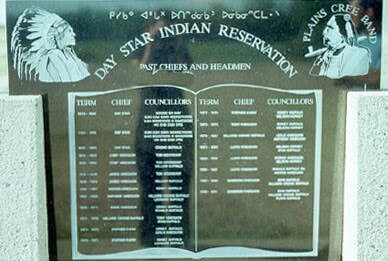 The Day Star Reserve is located in the Southeastern segment of Saskatchewan near the town of Punnichy. This reserve is 6724 hectares in size with a population of 385 people of which 117 reside on the reserve. ​This reserve came about after Chief Kii-si-caw-ah-chuck signed an adhesion to Treaty 4. When the Treaty was signed, there was Chief Kii-si-caw-ah-chuck, two headsmen and 40 members belonging to the tribe. The land they carefully choose was heavily wooded for insurance of game and firewood in the harsh environment of the Saskatchewan prairies. Prior to this event the tribes of Kii-si-caw-ah-chuck roamed the vast prairie, particularly the area of the Touchwood Hills area. ​Prior to signing Treaty 4 on September 15, 1874, Chief Day Star (Kii-si-caw-ah-chuck) and his people hunted near the south branch of the Saskatchewan River. A reserve was surveyed in September 1876, with alterations made to the boundary in 1881 and 1888. 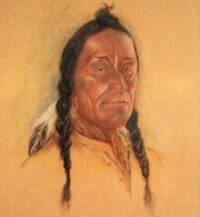 Day Star remained chief until his death in 1892. Initially, cultivation was done using spades and hoes, and a plot known as the “community garden” was maintained by the whole reserve. The community developed a fine herd of cattle, each farmer keeping his herd until they numbered 10 to 12 animals, then giving half of them to someone else who could then get started. After the band received walking ploughs they began to grow wheat, barley, and oats, and with the arrival of the railway in Lipton in 1905 an outlet was created for the sale of their produce. In 1946 Chief Kinequon and Willie Buffalo purchased the first tractor, and as more modern equipment appeared, people began to farm as individuals. Social events involved a variety of games including football for men and lacrosse for women, as well as horse racing, rodeos, and powwows; after a hall was built in 1938, dances and bingo parties were also held. In 1953 a hockey team was organized, and bingo parties were held to raise money for equipment. The 6,724-ha reserve is located 16 km north of Punnichy, with land also near Last Mountain Lake. There are 426 members of this band, 130 of whom live on reserve.